Vegan Sweet Potato Mug Cake Recipe - Oh My Veggies! Even though our next vacation is months away, I’m already in planning mode. Where are we going? What should we do there? Where should we stay? I totally have the travel bug right now. This is pretty much me in a nutshell–I’m a planner. I get ahead of myself. It’s kind of my thing. When I was graduating college, I wasn’t as excited as everyone else was because I was focused on grad school. We’ve lived in this house for two years, and I’m already looking at real estate listings for the next house. People sometimes take this as me never being happy with things, but it’s really just that I like having something to look forward to. It’s like with desserts. No matter how much you’re enjoying your meal, you still anticipate dessert. I always need a little something sweet after dinner–usually it’s just a piece of dark chocolate or something small like that, but sometimes if I have a light dinner, I have room for something more. But not too much–I don’t want a big slice of cake and I don’t want to do all the work involved with making a batch of brownies or cookies. That’s why I love mug cakes! 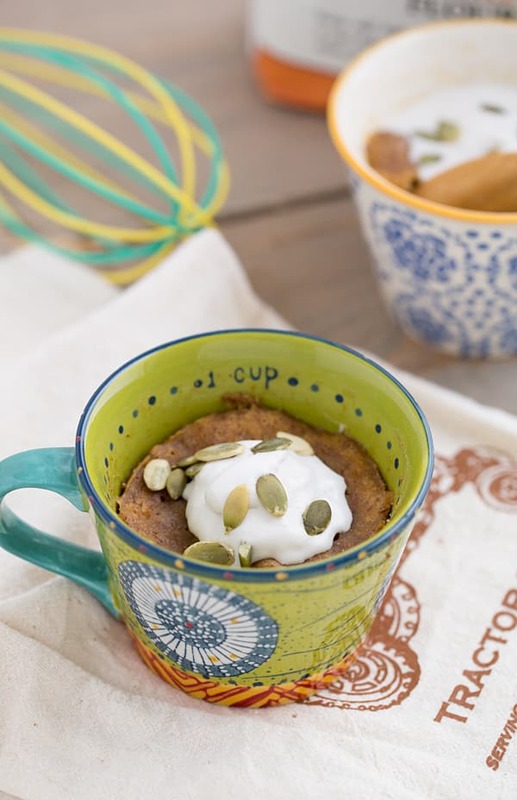 A vegan Sweet Potato Mug Cake recipe from Leslie Bilderback’s Mug Cakes: 100 Speedy Microwave Treats to Satisfy Your Sweet Tooth. In a large mug, whisk together the egg substitute and water with a fork and set aside for 5 minutes to thicken. Stir in the sweet potato, soy milk, vanilla, and sugar. Add the flour, salt, and spices. Beat the matter until smooth. Fold in the nuts. Divide the batter between two mugs. Microwave separately for 1 1/2 to 2 1/2 minutes each until risen and firm. I made my mug cakes without nuts and topped them with coconut whipped cream and pepitas. Delicious! Oof it’s been way too long since I’ve visited your blog. Everything looks delicious! I’m the same way about needing something sweet after dinner. I just need it to signal the end of the meal or I keep mindlessly snacking–it’s bad. And looking forward to things! I definitely do that too, and I love to come up with a lot of different possibilities for things (especially vacations–hello Bahamas, NYC, Greece, LA, Seattle, Italy, North Carolina), only to get frozen with indecision when the time comes to actually narrow things down to one. Can’t wait to hear what your next vacation spot is! If you ever come to Texas (but really, Austin is nice), let me know! And I LOVE SWEET POTATOES!! Definitely trying this mug cake soon. I was visiting your blog tonight too and then I logged into mine and saw your comments–freaky! I never thought of that need for dessert as needing a signal to stop eating, but I think that’s true! I totally want to go to Austin someday. 🙂 We’re planning a big trip to Hawaii when I finish my book, so that’s what I’ve been daydreaming about. We always go on doing things vacations and while I love doing things, I am totally due for a relaxing on the beach vacation! 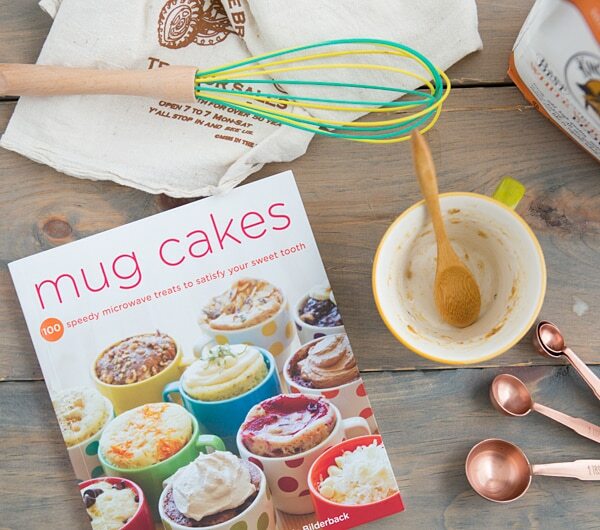 I can’t believe theres a whole cookbook devoted to mug cakes – they think of everything these days! I love the idea of a sweet potato version, and that it doesn’t need an egg! I think mug cakes can use a little something on top (since they can be a bit ugly), so coconut whipped cream sounds perfect! Yes, they do need a little something! 🙂 I was in a race against time to get these photos taken before the whipped cream melted though! Yup, I bet you could easily make it savory too! I had no idea there was a whole cookbook of mug cakes! This makes enjoying a sweet treat easy without being tempted by making a full batch of temptation. Yeah, I totally cannot bake a whole batch of cupcakes or brownies. My metabolism will not allow it. Am I missing something? How is brown sugar considered sugar-free?? It’s not sugar-free. The chapter on special diets contains recipes that are gluten-free, sugar-free, and vegan, but not every recipe fits all of those diets. Some are just vegan (like this one), others are gluten-free, others are sugar-free. Thanks so much for the Sweet Potato Mug Cake recipe…one of my favorite veggies, all dolled up in those supercute green mugs! Where did you find them? We always had those tubs of generic ice cream in the freezer too. 🙂 The mugs are actually measuring cups–I got the lighter one is from Pier 1 and the darker one is from Anthropologie. This recipe was absolutely amazing i made it the other night and it made my house smell amazing and it tasted even better. Thank you soooo much for the recipe!!! and one more thing where did you get both your mugs from they are so adorable? What brand are they? What about people who are allergic to Kosher?